I am heartbroken right now. I was supposed to go to Skate America or Skate Canada but things fell through and alas, I will be stuck watching this at home. Sigh. Well, here are my predictions, whether or not I’m in Detroit. Takahiko Kozuka looked in good shape at the Japan Open this year, after a disappointing season last year, as he handily beat fellow countryman, Daisuke Takahashi, who will also be competing at Skate America. I’m not sure if Daisuke’s expressivity will be able to trump Takahiko’s clean(er) program and solid skating skills. Daisuke’s jumps and spins looked terrible at the Japan Open and he’s also the type of competitor who’s a little weak at the beginning of the season. In any case, I just hope that Daisuke can at least get on the podium but his level of skating leaves the door quite open for other skaters. A wildcard that can surprise a whole lot of people here is Denis Ten who was a surprise spoiler for silver at the World Championships last year. The only problem with Denis is that he is completely unpredictable. His sudden rise at Worlds was completely unexpected because he’s a known headcase but let’s hope that things go well for him. Good skating is always appreciated. UPDATE: Denis Ten will not be competing due to illness. More info in this article. Max Aaron also has a chance to take a medal on home ice. After all, he did win U.S. Nationals last year and his results at other competitions haven’t been terribly atrocious. As well, home ice does tend to favour their own people. The contest for gold I think will come down to two ladies here at Skate America: Mao Asada and Ashley Wagner. Mao’s looking more solid than she’s been in the last two seasons and she seems to have grown into longer and leaner body. However, with a home ice advantage and a solid skate at the Japan Open a while back, I think the gold will go to Wagner. Whether she can stay near the top for the rest of the season is altogether another debate. As for the bronze medal, I’m hoping that the little phenom, Elena Radionova, will dazzle us all. Elizaveta Tuktamysheva might be able to squeak a win but she’s grown inconsistent of late. I’m sure there will be fans arguing on behalf of Caroline Zhang, who has improved in the last few seasons and Samantha Cesario, who seems to have quite a few fans but I’ve never quite understood the hype about this girl. Without a doubt, Tatiana Volosozhar & Maxim Trankov will win this competition. They are a head and shoulders above the rest. As for the harder predictions to make, the silver and bronze – well, let’s just say I’m really unenthusiastic about making these predictions because the pairs field is once again, really lame. I’d say the silver will go to Kirsten Moore-Towers & Dylan Moscovitch. They’re not a bad pair but they’ve been tumbling down the ranks in international competitions because *The* new Canadian pairs team, Duhamel & Radford. As for bronze, I’m hoping for a victory for Stefania Berton & Ondrej Hotarek since I like their classic pairs style of skating but they’ll face competition with Caydee Denney & John Coughlin on home ice and of course, another Russian team, Ksenia Stolbova & Fedor Klimov. Without looking at the roster, I know already that the winners here will be Meryl Davis & Charlie White. I just hope that they’ve improved since their last competition. At Skate America, Meryl & Charlie just need to concentrate on improving themselves, the rest of the competition don’t really matter. Anna Cappellini & Luca Lanotte will likely place second after finishing strongly in 4th at Worlds last season. 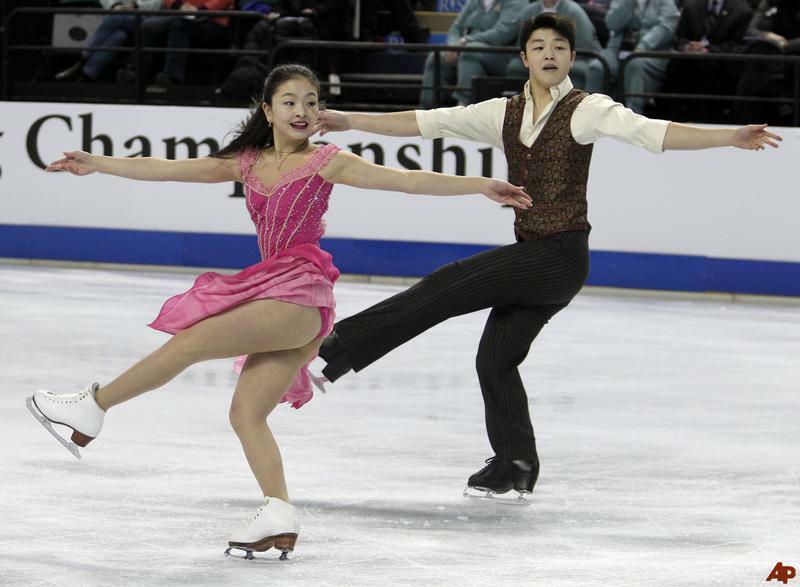 This means that they’ll likely beat siblings, Maia & Alex Shibutani. Who knows, I’m hoping for surprises here. The Senior Grand Prix Series is almost here!! !